This is an update to my favorite post of all time, my mom’s yukgaejang recipe. It has also been a Cozybogie favorite over the past four years (! ), thanks so much for all of your support! I made a video to help demystify anything that the pictures failed to explain. Please let me know if you have any lingering questions. I’ve copied some of my notes/pictures from my previous post here, as they still apply. I took my old recipe and updated it with some minor improvements over the years, and I’ve got to admit….it’s better than ever. 1. Many Korean grocery stores sell a special cut of beef made especially for yuk gae jang, or for making beef stock. I strongly recommend using this if your grocery has it. If not, using brisket and a mixture of beef bones will work just fine. This time, I used around 3.5 lbs of beef soup bones and 2.5 lbs of beef eye round and beef shank. Any cut of beef with a long grain is fine (ie flank, brisket, beef eye round, beef shank). 2. I like to use red chili flakes on their own in this recipe, as opposed to a mixture of chili paste and flakes. The paste can leave the broth tasting impure and sweet. 3. Using a lot of fresh, green onion is a key flavor component to this recipe. Halve the white portions length-wise because the white part is often too thick. I know 12 stalks sound like a lot, but don’t leave it out. 4. My favorite part of this soup is the egg, so I use 3. If you don’t love eggs as much as I do, feel free to use 1. 5. Use fernbrake root, also called boiled royal fern. This can be found in the refrigerated section. Yuk gae jang is not yuk gae jang without this delicious root. 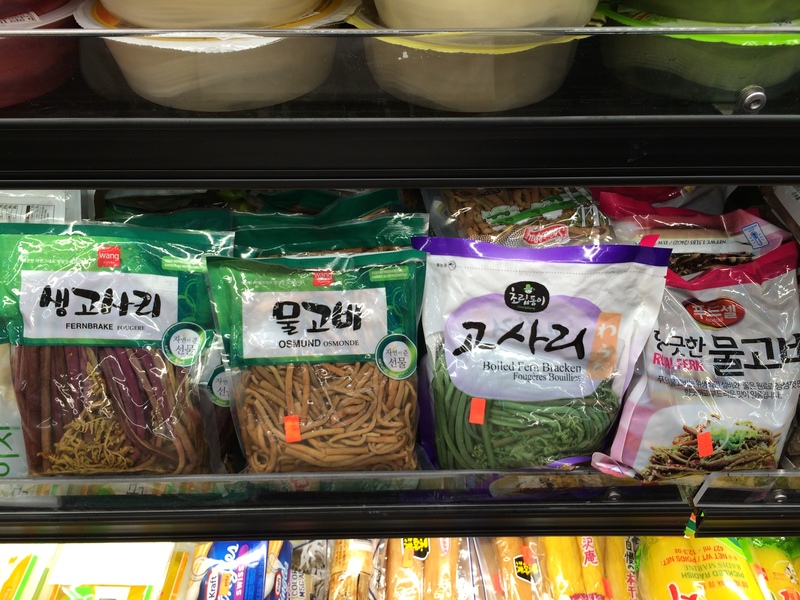 I noticed it’s also called “osmund” at H-Mart. I’ve also found it in my Japanese grocery store as “Warabi”. 6. You can either use mung sprouts or kong na-mool (bean sprouts). 7. This may sound like cheating but if you have it, feel free to sprinkle in a little beef da-shi-da (Korean beef stock powder) towards the end of cooking. It’s fine if you don’t have it or can’t find it, but it adds a nice extra bump of flavor. Bring the meat, bones, and water to a rapid boil on high heat for 5 minutes. When you see all the impurities and foam rise to the surface, take the pot off the heat. Carefully, drain the water and rinse the meat and pot quickly with cold, clean water. Add the meat back to the pot and refill with another gallon of water and bring to a boil—the water should be clear. Reduce the heat to medium, add the onion and radish, and simmer the beef for at least one hour covered. Remove and reserve the radish after one hour. If possible, simmer for 3-4 hours, while keeping a vigilant eye on the water level and replacing water as it evaporates. Trim sprouts, and rinse the fernbrake root several times with cold water. Drain, and set aside. Cut green onions into thirds, set aside. Separate the whites and greens. Slice radish into thin 1/4 inch slices. When the broth is ready, carefully remove the cooked beef, radish, and onion pieces. Skim the fat. Carefully drain the soup into a large, heat-proof bowl using a fine sieve to catch any bone fragments (you may need some help here if the pot is heavy). You will have 16 cups of broth. Wash the pot with soap and water and return back to the stove, along with the reserved broth. When beef is cool enough to handle, shred the beef into spaghetti-width size pieces and place into a big bowl. To the shredded beef, add the fernbrake root, sprouts, and white part only of the green onion pieces. Add the marinade into the mixture and using your hands, toss all of the ingredients together gently. Add the rest of the green onions, shiitake, radish, and enoki mushrooms and simmer for 5 more minutes. At this point, you may add the beef stock powder dashida desired. 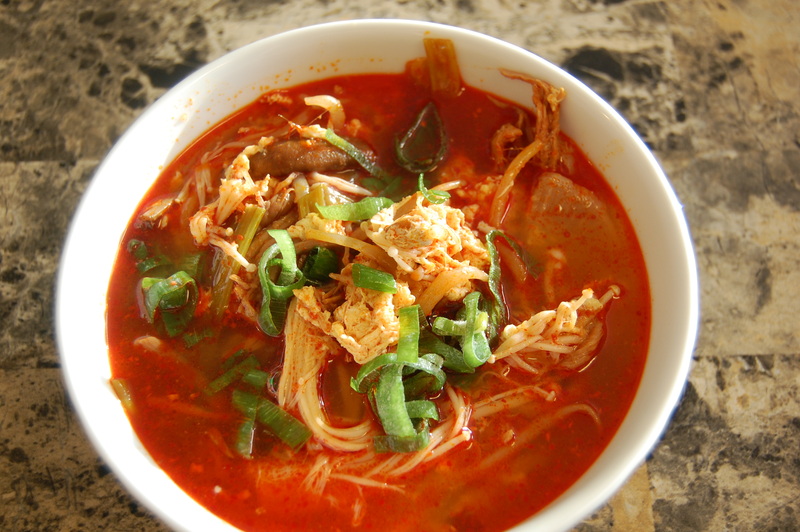 You are currently reading YukGaeJang 육개장 – Spicy Beef Soup Part Two at Career: Housewife.